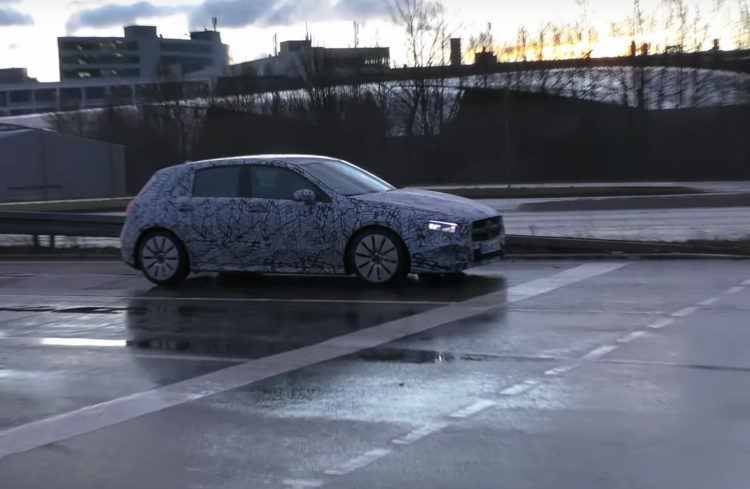 Rumors of a new AMG model from Mercedes-Benz`s A-Class that would tackle BMW`s future M140i or Audi`s S3 Sportback are not new, and as we can detect from the spy video below, Daimler is indeed working on the A 35 AMG, set to be a nice hot hatch with inspirational design from the Concept A Sedan, revealed last year. As we can depict from the spy video, the model is fully wrapped in camouflage which means that it is in its early testing stage. It shows a subtle front spoiler and new bumper bar, while the rear end stands out from the crowd with an aerodynamic diffuser. The all-new 2018 Mercedes-Benz A 35 AMG will sit below the A 45, meaning that it won`t be a high-performance model. We are dealing thus with the direct rival of the new M140i from BMW and the S3 Sportback from Audi. Just like its rivals, the new A-Class will stand on a new platform, presuming with an all-wheel configuration. This would make perfect sense, since the M140i from BMW will underpin an all-wheel configuration on a front-drive-based platform. As for performance, the new A 35 AMG from Mercedes-Benz is set to feature a 2.0-liter turbo flat-four engine with around 220 kW, which is quite enough, given its tight connection with its bigger brother, the A 45 AMG, which now outputs 280 kW. As for interior details, the 2018 Mercedes-Benz A 35 AMG will carry over the premium and high-quality materials from the entire fleet, adding as well the latest gadgetries. More details will emerge later on, meanwhile, take a closer look at the spy video revealing the A 35 AMG`s wrapped-out body style.